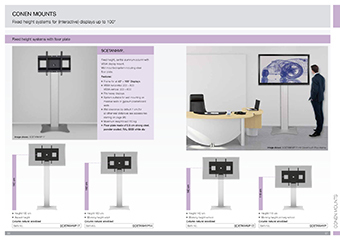 Fixed height monitor stand for 42"-100" touch screen displays. For applications that do not necessarily require height adjustment or where price is key, Conen Mounts offers a series of fixed height solutions. The monitor stands feature a sturdy aluminum center column that comes in different heights. Mounted atop the center column is the display mount which allows for cables to be stowed away neatly behind the touch screen display. A 0.3" thick, solid steel plate secures to the center column. Designed for static, freestanding applications or to add stability to wall mount systems, secured to e.g. a stud wall. The floor plate features cut-outs/ handles for easy transportation. It comes powder coated in grey aluminum. The unit comes flat-packed in 3 cartons and is courier-shippable. Frame for all 42" - 100"
Center to floor distance 1920 mm 75.6"
With the new innovative quick snap locks the monitors can simply be hung in place on the monitor wall mount. This makes the assembly easy and fast. In addition, the monitor can be secured against theft with a standard pad lock. The 8 mm strong base plate allows the mounting of our monitor mounts on lightweight walls or a freestanding installation in the room. 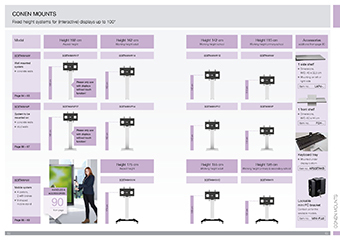 The weight of the monitor is transmitted through the column to the floor plate and thus to the floor, maximizing stability. By default, we supply wall mounting brackets with each display wall mount. This wall mounting set consists of two galvanized Z-shaped brackets, which allow a wall clearance of 2.76 inch (7 cm). Further wall mounting solutions are available as accessories.